If you’re like us, then you love the steampunk movement. Steampunk has its roots in books by authors like H.G. Wells and Jules Verne, but it grew as a popular subgenre during the late 1980s and early 1990s. Combining elements of the literary version of The Old West with Victorian-era fashion, steampunk melds history with science fiction to create new and unique worlds. Enthusiasts often wear steampunk outfits and enjoy all sorts of steampunk-related books, graphic novels, and TV shows. If you’re new to the steampunk movement, here are some resources to get you started! http://www.steampunk.com/ – This is a great resource for all things steampunk. Fashioned like a blog, this site provides you with news, events, a primer on steampunk, and even a bookstore to help you stay up to date on all things steampunk! http://steampunkworkshop.com – Another blog site with a unique twist. This not only contains news updates but also how-to instructions for D.I.Y. steampunk projects. http://www.steampunkmagazine.com/ – This site is great! Featuring stories, interviews, and historical and scientific articles, Steampunk Magazine is definitely one of the best publications on the internet today for all your steampunk needs! As the movement grows, so too will the resources online. 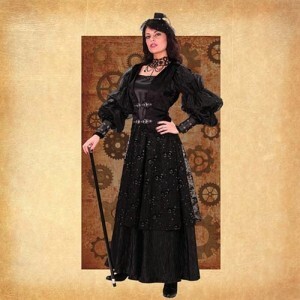 Be sure to visit PearsonsRenaissanceShoppe.com for more information on steampunk and to buy some great steampunk outfits!